This 3 housing system is designed to provide up to 3 l.p.m. of high purity water. This unit produced C.A.P. or NCCLS Type I quality water or better. The E-pure systems produce up to (3L/min. of Ionic, organic and bacteria free water. Virgin polypropylene water pathways prevent recontamination. One-quarter turn quick release filter housings allow for easy cartridge replacement. Positive O-ring seal on head-to-canister connection. Flat-bottom canisters stand on benchtop during cartridge servicing. Includes solid-state digital purity meter that displays output water resistance from 0.01 to 18.3 megohm-cm with automatic temperature compensation to 25°C (77°F. High gear ratio recirculation pump supplies ultrapure water without long rinseup, plus quiet operation. Inlet temperature range, 4° to 49°C (39° to 120°F. 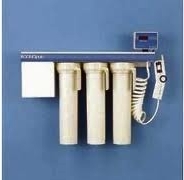 These systems can run on tap water but it is remended that you pretreat them with either reverse osmosis or deionized water. 6 ft. (1.8m of 1/4 in. O.D. flexible tubing for inlet and recirculation connections. Optional Organicfree* cartridge (Cat. No. 09-034-175K lets you use E-pure systems for HPLC and other critical applications. Can be used with optional remote dispenser accessory. Note:Filter cartridges and final filter are not included.